Stretch Tuesday has rolled around again. The selling of the Engel Collection is still fresh in every carnival glass collector’s mind. What makes for a record setting auction of carnival and/or stretch glass? Number one, would be the finest of carnival glass and/or stretch glass rarities. Number two, beautiful pieces of iridescent glass. Just because a piece of carnival or stretch glass is rare does not mean that the piece is beautiful! Number three would be to publicize the glass and the auction. Karen Engel has been a carnival glass collector for many years. Plus it is no secret that Karen inherited her dear friends’, Dale Matheny and George Thomas, collections. All three collectors, had a keen eye for purchasing only the finest of carnival glass. Jim Wroda and his crew showcased the Engel collection in an outstanding auction catalog. The photographer brought out the color and iridescence in every single piece. The publicity costs were considerable, but with this collection the money was well spent. When we met Dale and George in the mid-seventies, they collected cut glass. Then they added stretch glass to the cut glass collection. But when they met and visited Don and Connie Moore, they fell madly in love with carnival glass. 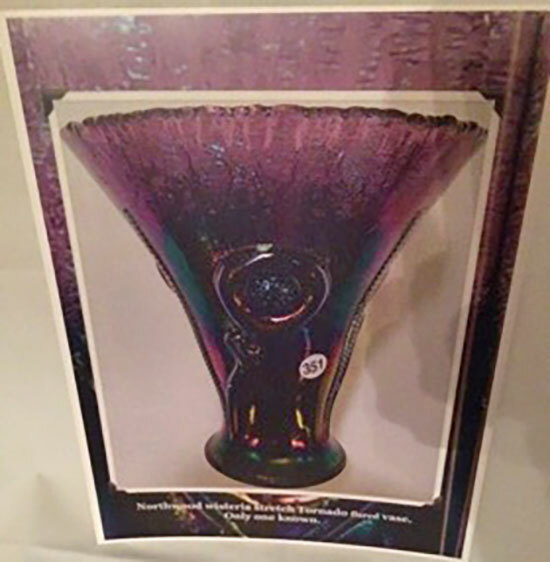 Dale specialized in carnival glass plates and George loved vases. George had a number of outstanding carnival and stretch glass vases. What most people are talking about are the Tornado vases in celeste blue and in wisteria. 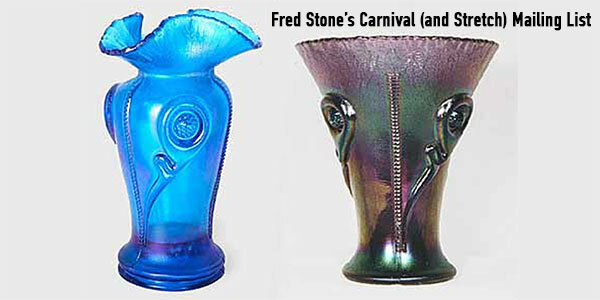 For George they were the best of two worlds; his love for both carnival and stretch glass vases! 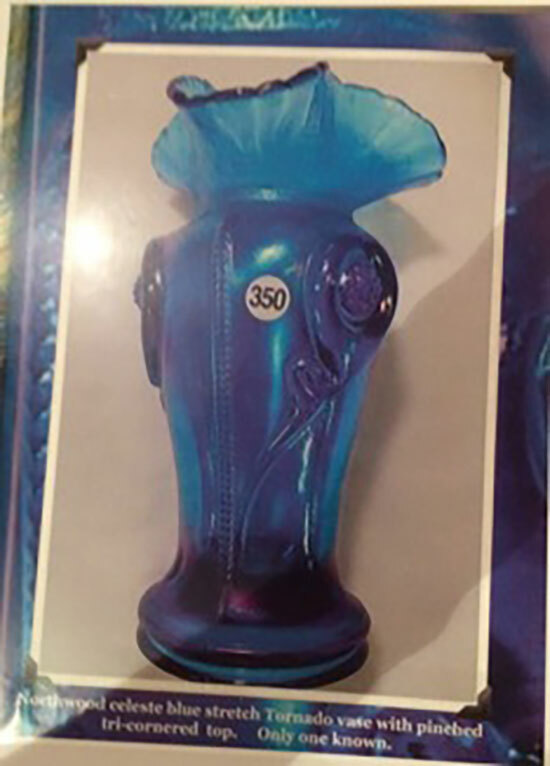 We were very pleased with Wroda’s description of the vases as “Northwood celeste blue (Fenton’s name for this color) stretch Tornado vase …” Since Northwood made the vase, sapphire blue would be the correct color name even though this vase is the very same color as Fenton’s celeste blue. Yes, we did check the color out in person right after Dale purchased the vase and again when we visited Karen. The wisteria stretch Tornado vase is also awesome. Both vases are pieces of patterned carnival glass with a distinctive stretch finish. Congratulations to the new owners of the Tornado Vases. They are each a rare, wonderful piece of carnival glass with a stretch finish! Now we shall see what happens to the Tarkington Collection at the upcoming ICGA convention. Seeck Auctions has put out a very nice and enticing auction catalog for the Tarkington Auction. PS Don’t forget the Stretch Glass Society’s Annual Convention coming up July 26-28 in Marietta, Ohio. Come see us; we will welcome you with open arms and show you some amazing stretch glass. Plus keep sending in the beautiful pictures of carnival and stretch glass to HOC. The stretch glass sandwich servers do easily showcase the iridescent beauty of stretch glass. Plus they are very handy when serving cookies. Brian, your photos of carnival glass on Sunday and Monday’s HOC are outstanding.